Last edited by StillBoostin; 05-07-2008, 07:50 PM. My trade for over 30 plus years has been auto collision repair. I have had other passions over the last 20 and one of them has been the art of a skill of welding and making things with my own two hands. I will not ever claim to be an expert here on this discussion list, and am only here to learn. 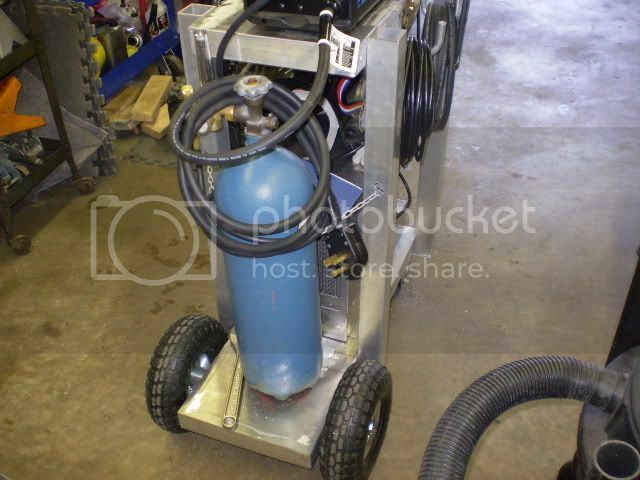 I looked at this thread a while back before joining the group and needed a weld cart similar to the one on this thread. I used whatever leftovers from another learning project to build my cart, but still had to spend quite a bit of money for materials to get it to where it is now. I had different ideas, like putting the axle on the back so the cart didn't do a wheelie when I put the argon bottle on it. Making it bolt together, in case I decide to paint, anodize or powder coat. And jut trying to learn to run a tig bead on aluminum. I must warn that my little giant inverter is of a different color. I will post pics after I reduce the resolution. Happy arcs ,sparks and splatters. Here ,(hopefully is photos) of my project. These are reduced photos of my pic,s. Happy arcs, sparks and splatters. Get me to thinkin on getting a lot more orginized in the shop. Glad I could inspire you, That means a lot to me(being new here and all). I did mine really cheap. What was expensive? I put the rear wheels in the middle to straddle the weight. It allows for better turning. Also I'm gonna mount the front wheels out wider to make it more stable. With the water cooler on the bottom it is almost impossible to roll it. It race cars so I'm a little **** on stability. My cart has some stuff welded but my 2x2 are bolted on for now. Once I learn how to tig then I'll make the cart real pretty with tig welds all over. I might change some stuff up. The 2x2 are way over kill, and the steel solid rear axle is a little heavy. I found some killer wheels at HF that a solid and light weight. My goal was to make it as light weight as possible. Wish the water cooler had a handle on it. Not portable at all. Gonna buy a air- cooled torch for those on site jobs. And a new helmet. Last edited by StillBoostin; 05-20-2008, 08:54 PM. I meant to say that my cart is both welded and bolted together. The 1 1/2' angle alum. cost me 40 dollars a stick and I used 3 of them so that is why I say it was a little expensive. I need a few more hooks for things like the wire brush. hand amptrol and the air cooled torch. I took a class at the community to learn the basics of tig welding, but it is still a challenge to me. Especially working with Aluminum. i made my cart out of aluminum also. seemed like a good first project for my new TIG. also not Blue,(TA-185) but i disguised it from the millers so they don't pick on it wile I'm out of the shop. total build $ was about $20. 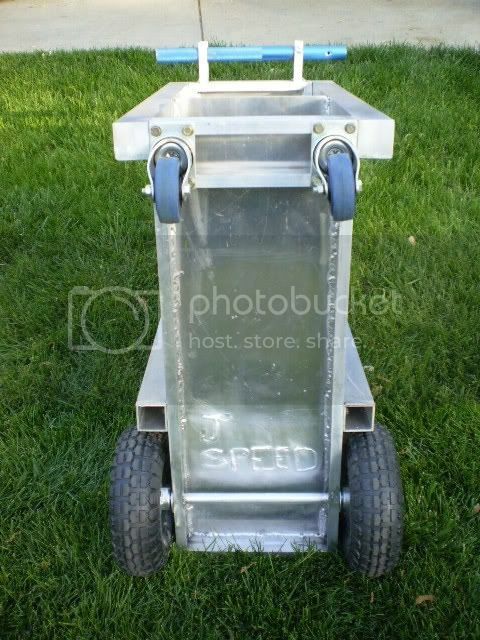 the aluminum and front wheels came from a bread cart (i think) that was hit by a car in a shopping center parking lot. the diamond plate for the foot control was left over scrap. gotta love free-bee's. but i had to buy the back wheels. i figured i spent all that $$ to get a TIG with AC for aluminum it only seemed right to TIG up an aluminum cart. it was great practice and i learned a lot doing it. right now it just holds the basics. when i get around to making a cooler for it i will change the design as needed to fit the new accessories and cooler. one of the benefits of having the welder is being able to change as needed. I like your cart as well. I pondered the idea of building my own cooler also. I read discussion threads from other groups besides this one on how to. looked for the parts on e-bay as well as condensing things from my line of work. 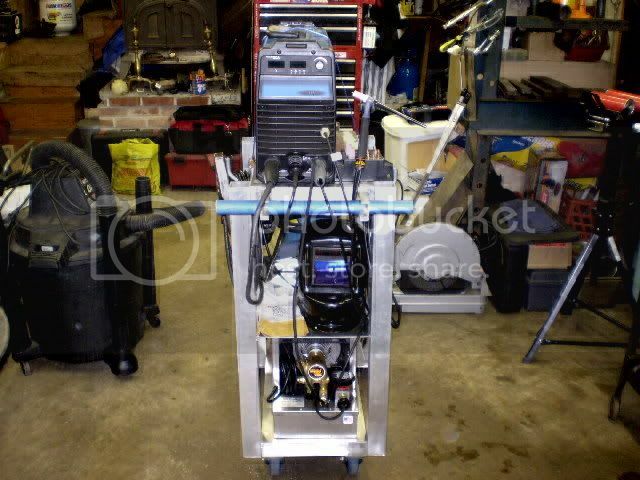 I also chased a few of the used coolers on E-bay. I decided to buy the new one I got off of e-bay from one of the e-bay stores that I have done business with before. I figured it would probabally cost me more in the long run if I tried to do it myself. 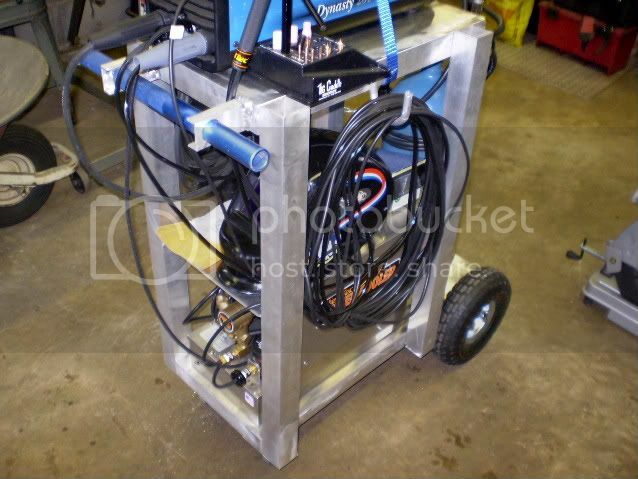 one can actually buy certain things cheaper off e-bay than your local welding supply can buy them at wholesale level if thier volume is a little low and most purchaces are tax free and free shipping. So my water cooled tig rig was a no brainer to me. Mine was the entry level one with the vinyl hoses but for a home garage unit I went for it. [when i get around to making a cooler for it i will change the design as needed to fit the new accessories and cooler. one of the benefits of having the welder is being able to change as needed. We have the same cooler. It was origanally made by Bernard. A pretty reputable company. Nothing wrong with a a full SS shell. Pump looks pretty stout too. For the price you can't beat it. It retailed for $1000+. We paid almost half with a torch. A Great deal. Almost went BLUE, but couldn't pass up a great deal. I bought a nylon webbing sleeve to prevent wearing down the nylon hoses. It was about $30. I'm gonna but an Air cooled torch. Which one should I get? [ I'm gonna but an Air cooled torch. Which one should I get? I don't really know but my miller maxstar and the lincoln v205 both came with #17 torches. The good thing about that is that parts interchange with both of them. But I still need to buy a few things for the wt 20 that came with the cooler because the #17 parts wont interchange with the wt 20. Someday when I got extra money, I may get one of those pyrex cups from HTP. I also bought one of those nylon covers for the cooler hoses. I was surprised that it didn't come with the cooler. also the #26 (200amp A) will interchange with the #17 & #18.
for long air cooled use the #26 is said be be much nicer than the #17. this should give you an idea as to what all will interchange. if you intend to do mostly water cooled work and only use air for a few quick small projects it might be a good idea to get a #9 for that and keep all parts interchangeable. you torches will be small and easy to handle. use the #20 for thick or long run jobs and the #9 for the little stuff you don't want to mess with dragging along the cooler. if you intend to do a lot of air cooled work away from the shop you might want to get a #26 and keep it in a to-go bag for on the road work. the #26 will stand up to the Dyn in the field much better. TIG is expensive no way around that. but torch parts don't wear out every day. investing in a 2nd size is not so bad an option. That is good info to have, "the interchangeability of tig torch parts".